Naan is very popular Indian bread not only in India but worldwide. 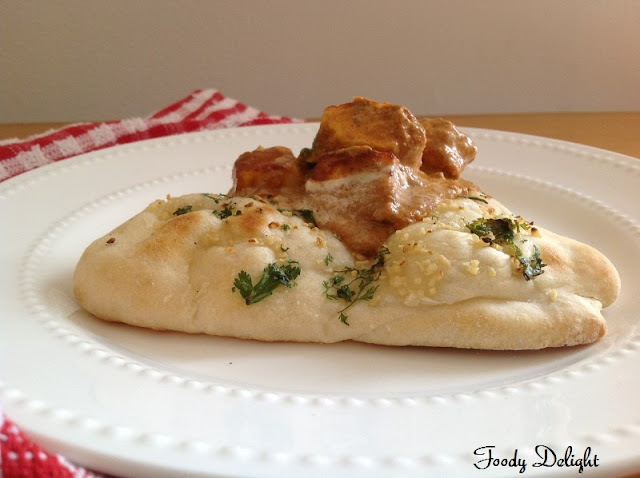 Naans can be made with varieties of flavours.Today I am here to share Garlic naans .The best thing of these garlic naan is, they are egg free naans.These soft and fluffy naans can be easily prepared at home. Naan is traditionally cooked in a clay oven or tandoor. This recipe uses a regular home oven. For the healthy version naans can be prepared using whole wheat flour and very soon I will come up with the best whole wheat naans. Add yeast and sugar to the warm water and mix well. Let it rest and rise for 10 minutes. Combine all purpose flour and salt into a large bowl.Mix well and keep it aside. After 10 minutes,check the yeast mixture.Add yogurt and melted butter into the yeast mixture.Mix the mixture well. Then add this yeast mixture to the flour mixture and knead the dough well.If the dough will be stiffy,do not worry .It will be correct after it will rise. Cover the dough with the plastic wrap or clean kitchen towel. Keep it in the warm place and leave to rise for 30 minutes. After the dough is risen, punch the dough and divide the dough into equal portions balls and place them into another greased bowl.If required lightly coat your hands with oil while dividing the dough.Cover the dough and leave again to rise for another 20 minutes. Meanwhile prepare the toppings by mixing minced garlic and chopped cilantro into one bowl. Dust the rolling place and roll out each balls into triangular or oval shape about 1 cm thick. Place the naans on the baking tray, brush the top with little oil and sprinkle 2 tsp of topping mixture.Press the topping mixture lighty on the naans. When oven is hot, place the baking naan tray in the oven and bake the naan for about 7 to 10 minutes.Flip the naans in between and bake till you see light brown spots on the naans. When done,apply the butter on the naan and serve hot. 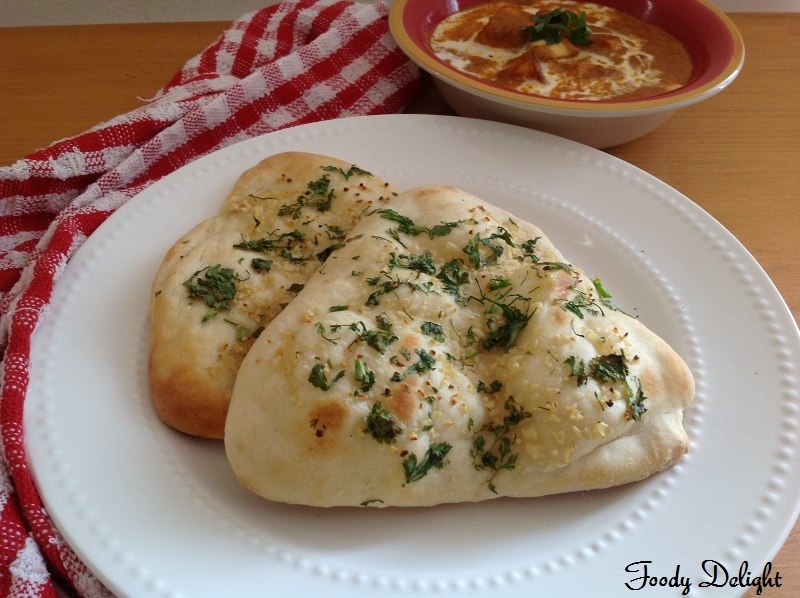 Garlic naan can be served with Paneer Makhni, Palak Paneer and many more. Interesting eggless version n looks soft!! Naan looks soft n fluffy! They have come out so perfect and rich.. Pretty much like the Dhaba Naans... good work ! Oh! These are so tasty ,well done with amazing garlic flavor! 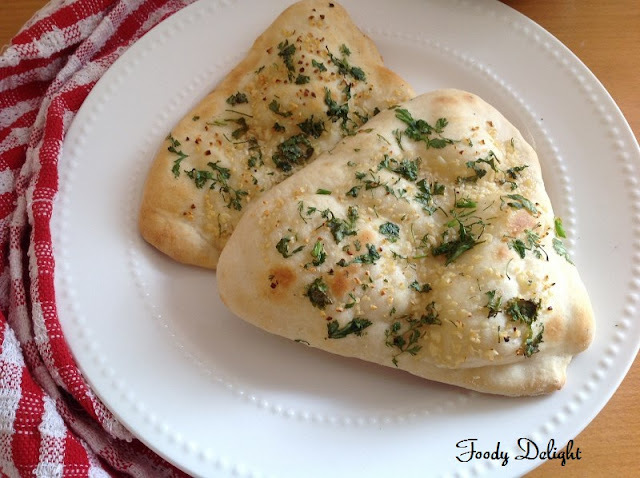 I adore garlic naan bread. Love the individual portion sizes - much better than the huge ones I normally see. 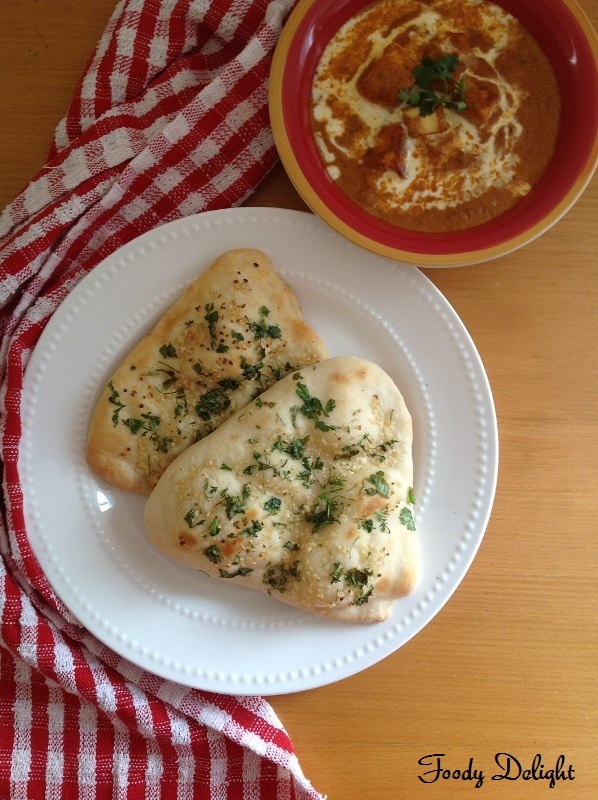 so soft...who needs pizza when we have this naan? !